This adorable costume is fully lined and can be worn as a coat or a costume. Super soft and cozy. Looking for a fun & unique dog costume this Halloween? 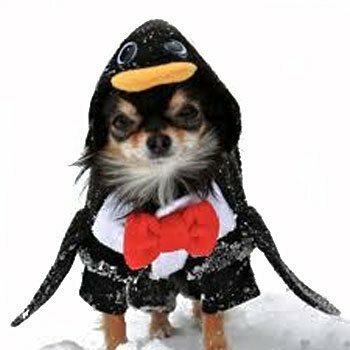 This adorable Penguin Dog Costume is sure to be a hit! Made from soft, warm fleece and designed a little looser for a more comfortable fit and easy movement. Cuffs on arm and leg openings are made from a ribbed, ultra-stretchy fabric, making it very easy on/off. Complete with attached penguin wings and a "tuxedo" look in front with red fleece bow tie. The attached hood features a bright yellow beak and bobble eyes. Tiny length up to 10 inches. Neck 6 to 8 inches. Girth 8 to 10 inches. Small length up to 14 inches. Neck 8 to 11 inches. Girth 10 to 14 inches. Medium length up to 18 inches. Neck 10 to 13 inches. Girth 13 to 17 inches.